Stanley Badock: The man, his house & his woods. Dr Sir Stanley Hugh Badock (son of William Frederick Badock) was born in Bristol on 27 April 1867 and grew up to become a prominent local industrialist. He had an impressive entry in "Who Was Who (1941-1950)" which included being a Director of Capper Pass & Son Ltd, who were metal refiners with a smelting works in Malago Road, Bedminster. He was also Sheriff of Bristol from 1908 to 1909 and the Founder and Chairman of the Bristol Civic League of Social Service from 1908 to 1936. 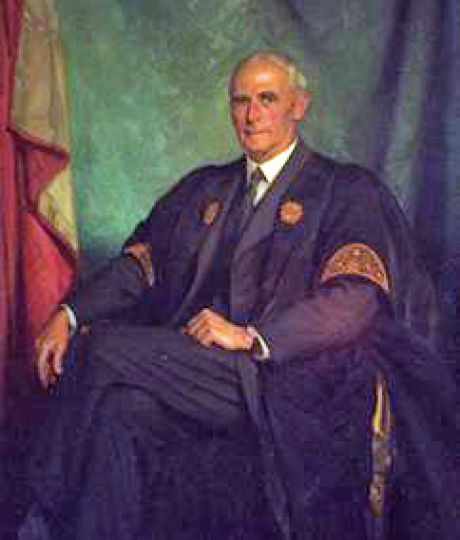 From 1922 to 1945 he was Pro-chancellor of Bristol University and Chairman of The University of Bristol Council from its foundation in 1918 until 1943. In 1927 he received an Honorary Doctorate of Law from the University. He was knighted in 1943 and died in December 1945. It is perhaps also worthy of note that his mother, Miriam, founded Badminton School for Girls. The painting of him is reproduced by kind permission of the University of Bristol. The history of the house (now "Holmwood House", located at the top of Channells Hill in Westbury-on-Trym) and the estate can be traced back to 1729, where it is mentioned as being a farm owned by a Mr Carr. In 1768 the house was purchased by a Richard Llewellin and was subsequently inherited by his son (also Richard) in about 1800. During his ownership, Richard II built a large brick extension to the front (South-East) of the original farmhouse. 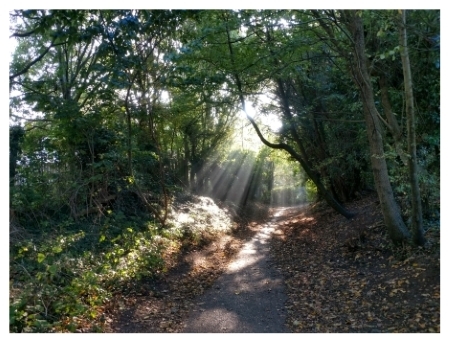 At about that time (c.1805) he bought Southmead Manor and its estate, which included the area now known as Henleaze Lake and an area that was later to become part of the Southmead housing estate The site of Southmead Manor, previously Southmead Farm, is adjacent to Southmead Police Station. Richard II died in 1825 but his widow, Anna, continued to live at Holmwood House until her death in 1851. The house then passed to their son, Richard III. Richard III remained a bachelor until he died in 1871. In 1872 the joint estates were purchased by a Mr Henry Green of Henleaze and the Southmead Estate was subsequently sold. During his ownership, Henry Green had the front half of Holmwood House faced with freestone. He died in 1885 but his wife (Elizabeth) continued to live there until she died in August 1904. At the age of 38, Dr Badock bought the Holmwood Estate in 1905, together with several other parcels of land. Apart from the house with its stables, outbuildings and gardens etc, he also bought the field east of the house, the majority of the wood later named after him and a pond in the wood (complete with weir). With the help of his friend, the eminent architect Sir George Oatley, he decided to demolish the rear half of the house and rebuild it to a different plan. This rear section of the house was the original farmhouse dating back some 200 years. During his tenure, Dr Badock was responsible for extending the lawns and gardens which included many of the non-indigenous trees in the grounds of the house and woods. His ambitious ornamental landscaping and planting scheme extended along the Trym valley, linking the Holmwood gardens with those at Southmead Manor House. In 1942 the Badock family moved from Holmwood to a smaller property at Knoll Hill in Stoke Bishop, where Dr Badock died in 1945, aged 78. In 1945, The National Children's Home purchased the house, gardens, paddock and the lower part of Badock's Wood. In 1972, an office block was added to the rear of the house, further extending the section rebuilt by Dr Badock in 1906. In the early 60's the lower part of Badock's Wood and the Kitchen Garden were leased to a David Chaffe in order to create the Westbury Wildlife Park. The Wildlife Park was officially opened by Sir Peter Scott in 1967. The house and parts of the grounds were sold by The National Children's Home for residential development/redevelopment in 1990. At the turn of the 18th century much limestone was quarried in the Southmead area. It was a general practice for the local landowners to lease out these quarries - a practice started by the Llewellins and continued by Henry Green. At one site, quarrying ceased in about 1910 and the quarry was allowed to fill with water. It then became known as Southmead Lake and then subsequently as Henleaze Lake. In about 1911 Dr Badock rented the lake and stocked it for fishing. He also leased part of it to a third party (Mr Curtis) who admitted the public for bathing. The Henleaze Swimming Club was founded there in 1919. In 1924 Dr Badock bought 83 acres formally belonging to the Llewellin family. This included The Lake, which he subsequently sold to the Swimming Club in 1933. In April 1937 Dr Badock gifted 15 acres of playing fields and woodland to Bristol City Corporation, in perpetuity, but this was conditional on Bristol City Corporation also giving-over 15 acres of their adjacent land for the same purpose. Following from this transaction, the name "Badock's Wood" came into existence. Under the Deed of Gift, Bristol City Corporation (now Bristol City Council) was to maintain an un-climbable iron fence along the western boundary of the land. Also, no structures could be erected except such buildings and works "as was necessary to protect the lands".